DataDemon is the ONLY commercial data analysis software with build-in Hilbert-Huang Transform (HHT) Technology licensed from the National Aeronautics and Space Administration (NASA). DataDemon software is very easy to use. No programming skill is required. User can build the data analysis diagram with several simple mouse clicks and the results are ready for viewing and final reporting. 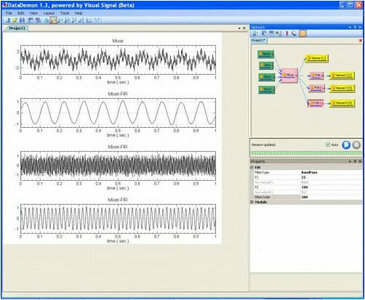 Besides HHT algorithm, DataDemon includes tools for data filtering, math calculation, statistics, matrix operation, data transformation and other popular time-frequency analysis (TFA) methods, such as short-term Fourier transform, (Enhanced) Morlet wavelet, and Hilbert transform etc.